Like a phoenix, 1time airlines is slowly rising from the ashes. 29 May 2014 : Mr R Ramkissoon Executive Director and COO of 1time has resigned from his posts. The board of directors announced to the shareholders through a statement that Mr. Ramkissoon will be stepping down from his positions from the 28th of May 2014. He stated that the reason for his resignation is that he wants to pursue new business ventures. The Board has thanked Mr. Ramkissoon for his contribution to the Group and wished him well. For the benefit of overseas readers, the name 1time airlines comes from the South African expression "one time! ", meaning "for real!" The airline was originally the brainwave of Glenn Orsmond who used to work at Kulula airline. He teamed up with Rodney James, Gavin Harrison and Sven Petersen and established 1time airlines in 2004. In November 2012 the original 1time Airline went into provisional liquidation. The holding company of 1time Airline, 1time Holdings, is being bought by Global Aviation (27%) and Pak Africa Aviation (45%). They plan to keep 1time listed on the JSE, and use Global Aviation's scheduled licence to start flights under the 1time brand. Ironically, some of the 1time founders are now trying to set up Skywise Airline. Even more ironically, another 1time airline used to lease some of their MD80s from Safair, which is trying to start up FlySafair. 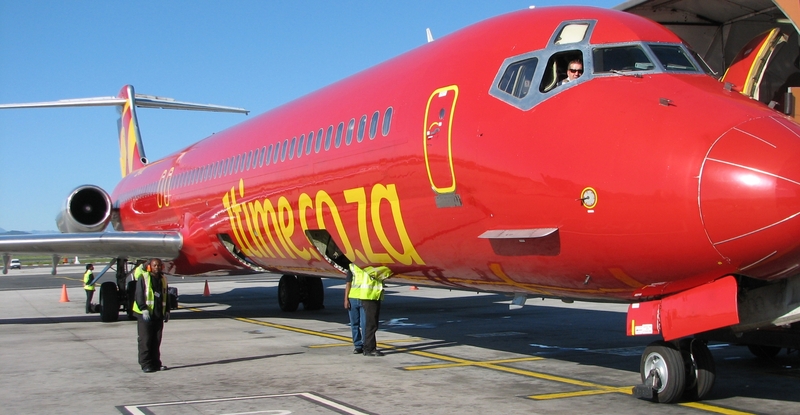 The other low cost carrier wanting in on the action is fastjet airlines. We asked travel blogger, Scarlet Nguni, what her thoughts are on new airlines starting up in South Africa : "I feel getting in a fresh new player would be beneficial to travelers - it's likely to lower prices and hopefully lead to a little more competition in the South Africa skies. I think a 75% local ownership is high - I understand and appreciate the need to boost our internal revenue/people but I think it misses the bigger picture: which is, the more competitive a market exists between airlines, the more competitively priced flights we can offer travelers. This is likely to make traveling to more places within SA more attractive which will ultimately increase tourism and positively benefit our economy. Esp with the NY Times announcing CPT as the place to visit in 2014 - other cities and areas could benefit from the influx of interest & travelers - and be encouraged to discover more of the county...if flights are more competitive as they are in Europe with the likes of EasyJet/JetBlue etc (those names might be wrong)". 1time flight bookings qualify to earn SouthAfrica.TO's exclusive travel vouchers. If you're one of the first to fly on the new 1time airlines we would love to hear from you. Simply email a writeup of your flight to cheapflights@southafrica.to and we'll end you a voucher. We have swept all the original 1time airline's reviews into a 1time flight reviews page. As soon as the new 1time has launched and we receive flight reviews, we will place them here. Global Aviation has bought 4 new Airbus 320s, and 1 will be delivered in January & another in February 2014; and they expect to start flights in March 2014 under the 1time brand. The idea is to operate flights between Cape Town, Johannesburg, Durban and PE, with the possibility of international flights from Harare. 11 September 2013: Pak Africa Aviation reportedly has an agreement in principle from the 1time Board & some 60% of 1time shareholders to buy 1time Holdings from them for R15m - basically they want the right to trade using the 1time brand name. They want to use Harare as a hub starting with Zimbabwean domestic flights under the brand "1time Zimbabwe", and to apply for an Air Operators Certificate in South Africa and connect the African region. They are waiting for JSE approval. Pak Africa Aviation are based in Sandton, Johannesburg, and plan to start an intra regional airline (i.e. one operating between African countries, similar to Fastjet - which was also at a stage interested in purchasing 1time). Pak Africa Aviation is in the process of applying for an AoC in SA. Pak Africa Aviation plans to use an initial fleet of ATR42s & ATR72s. The 1time Zimbabwe operation would be a JV with Central Air Transport Service, where Pak Africa Aviation owns 49%. IIt is provisionally scheduled for October 2013. Flights from South Africa to Pakistan & India will be considered down the line. The directors of Pak Africa Aviation are Muhammad Saleem Kachi Kumhar, Muhamad Yasin & Tabassum Abdu Qadir (the Chairlady). Is it PakAfrica (one word) or Pak Africa (two words)? "It's Pak Africa Aviation". What are the reasons you want to buy 1time Holdings? "Investors Confidence in view that corporate governance as well greater transparency is attached to a JSE listed company". When do you expect an answer from the JSE as to whether you can buy 1time? "October 2013". Who finances PakAfrica aviation? "Consortium of High Net worth individuals based in Pakistan and Dubai". Are you planning to let the 1time airline subsidiary of 1time Holdings go bankrupt? "YES" Or do you want to use its license? "NO"
What are your plans for the other assets of 1time Holdings? "1Time Holdings have no assetts . The assets belong to the subsidiary 1 Time Airlines in which we are not interested at this point as we will re-equip 1Time holdings with new assets." Do you intend to leave 1time Holdings listed on JSE once you purchase? "Yes". What planes do you plan to use and do you want to rent or lease them? "B-777-400 and ATRS Family. (72 & 42)"
What flight routes will you start on in South Africa? "We still under process to finalise under the virtue of research for high yield routes suggested by the route analysts. One of the strategy is to connect secondary airports and smaller cities and towns point to point". How far has your application for an AoC in South Africa progressed? When do you expect it to be finalised? "still in process. Its South Africa . things move slow than expected." How will you meet the 75% local ownership requirements to operate domestic flights in South Africa? "The Directors are south African residence and based in South Africa more than 20 years." Will Pak Africa start operating in Zim regardless of whether you get to buy 1time Holdings? "Yes but its a Plan B . Plan A is to get 1 Time Holdings and start simultaneously in both countries under 1 Time Brand. What other news can you share? "We urge the support of South African people to make 1 Time symbol of hope . Lets set a trend for the new generation to become saviours rather than victims"
The last 1time flight special was on the 3rd Oct 2012, a month before they went into liquidation, when 1time Premium Seating was launched, which was basically seats next to the emergency exit, where you could pay R50 or R100 extra to get the seats, depending on the route. We also have a list of all 1time flight specials. We will add the new 1time flight reservation details as soon as we have them. We retain here for historical reference purposes, the original 1time booking details (this will no longer be valid). For details see 1time flight schedule. On Friday the 27th April 2007, 1time Airline restarted its flights from Johannesburg to George. In March 2006 after 6 months of flying the route, 1time Airline had stopped flying from Johannesburg to George, due to lack of capacity. Each passenger may carry one piece of hand luggage, weighing not more than five kilograms (and must be small enough to fit into the overhead bins). No sharp objects allowed in the hand luggage. Checked baggage may not weigh more than twenty kilograms. Excess baggage will be charged for (at time of writing R20 per additional kilogram). You can take a bicycle with if it is not during the Cape Argus Cycle Tour. During the Cape Argus Cycle Tour there are specific arrangements. Please see below for packaging. "When I took over as 1time 's Group CEO in October 2011, I understood that I was taking over a company with financial challenges. But I also knew that I was inheriting a great brand built with blood, sweat and tears, passion, hard work and the enduring commitment of an incredible team." Looking for a job as a 1time flight attendant? Or perhaps as a pilot, airport ground staff or working in 1time's call centre. Email your CV to 1time at flightdeck@1time.co.za or visit the careers section of 1time's website. Note that most of 1time's jobs require you to work shifts, including public holidays and weekends. And those who've just hopped out of Pollsmoor - note that you're not allowed to have a criminal record and need your credit clear! The 1time airline fleet grew substantially from the single aircraft they started with in 2004 to 8 MD80 planes when they went into liquidation. The MD80s were stage 3 generation aircraft within the family of DC9 planes. The MD87 has 132 seats, whilst the MD82 and MD83 have 157 seats. Economy class seats are 5 across. TIP - ask for a seat on the front half of the plane. The MD8x series of aircraft have 2 engines under the tailfin of the aircraft, making sitting at the rear-end of the aircraft a noisy experience (akin to sitting inside a washing machine during its spin cycle). The MDx aircraft allow for boarding at both the front and rear-end. 1Time airline had a car hire partnership with Avis and a South African accommodation agreement with the City Lodge group. City Lodge and Avis offered discounted booking on 1time airline's website for passengers who had booked flights. Together with its flights, a 1time travel insurance product wa sold (which is underwritten by AIG Travel Insurance). Before listing, 1time Holdings Limited was 1time Holdings (Pty) Ltd.
1time Holdings Limited is Incorporated in the Republic of South Africa. Operating company for the private airline business, 1time airline. Manages a Boeing 727 VIP Jet for the Djibouti Government. Maintenance services for 1time airline's fleet and external parties. Competes with the technical divisions of Denel, SAA, and Safair. Offers charter flights to any destination in the world. Most of 1time Airline’s revenue is generated through selling plane tickets (which are mostly sold via its own Internet-based booking system, with the balance being made via its call centre and a small percentage being sold at airports). Other sources of income are sales on board flights (of soft drinks, snacks and alcoholic beverages), car rentals through Avis (1time airline’s car rental partner), City Lodge (1time airline’s accommodation partner), advertising (inter alia, on and in its aircraft and website), selling belly space to cargo agents and catering.